Today, November 27, 2010, the temperature is about 40*F here in central Maryland and we keep growing vegetables in our garden! Presently, we are growing/harvesting broccoli, peas, carrots, scallions, green onions, parsley, cabbage, potatoes, garlic and green peppers. While the garlic is growing for the next year, the other veggies are for consumption during the fall season or for hibernation over the winter until spring. Most of the veggies on our list won’t surprise you, except maybe the green pepper, but it’s the perfect example of cold weather gardening. 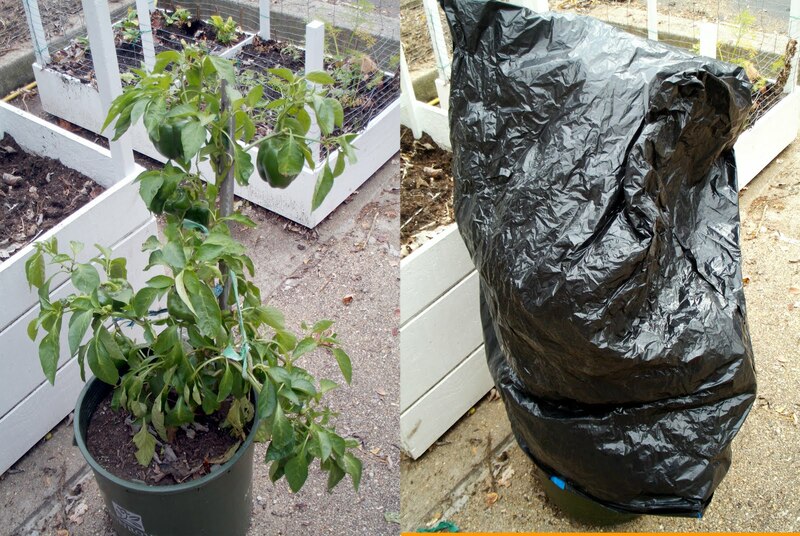 We grew the peppers during the fall when the temperature was above 60*F (until the beginning of November). Now as long as the temperature is more than 30*F, and we keep them covered at night when the temperature is below 39*F to keep the frost away from the plant, they will survive. For the peppers in the garden, a row cover is handy. It now stays on the plants all the time. For Thanksgiving, we harvested the peppers in the garden (about a dozen) and left the 2 plants (another dozen) in the pots alone. With some planning and preparation, it is possible to have a crop for fall/winter consumption or winter/spring consumption and even some crops will overwinter (a.k.a. hibernating). In the past we have had success in extending the scallions and peppers season and to overwinter broccoli under a plastic cover for an early spring harvest, but this year is the first time we really tried to push on the subject. For help, we used one of the 3 techniques below. Row cover. We used it on the peppers and now it’s broccoli time. We want to give the last head a chance to fully grow and we want to enjoy all the little side-sprouts from the 7 other plants. If we don’t harvest, the plant will go in hibernation. 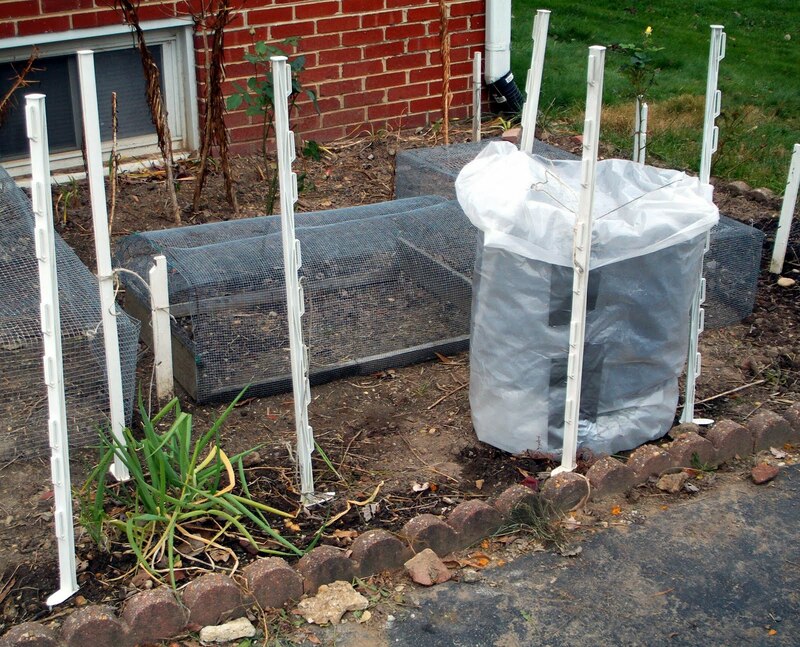 To help the last scallions to reach maturity, we use a cold frame made with chicken wire and plastic wrap. 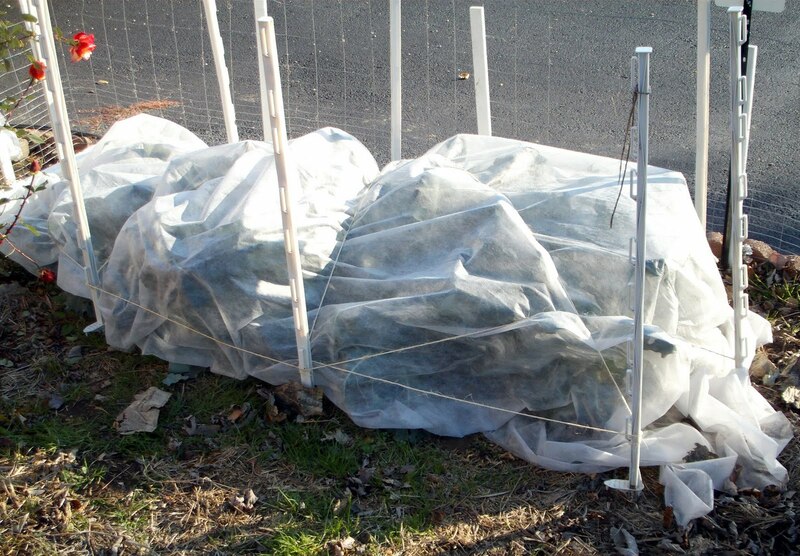 We use the same protection that we use to protect the broccoli when overwintering. For the green onions we use the double-covered bed technique. The onions are situated in a cold section of the garden and we want to keep the temperature near the ground higher than under a cold frame or row cover. 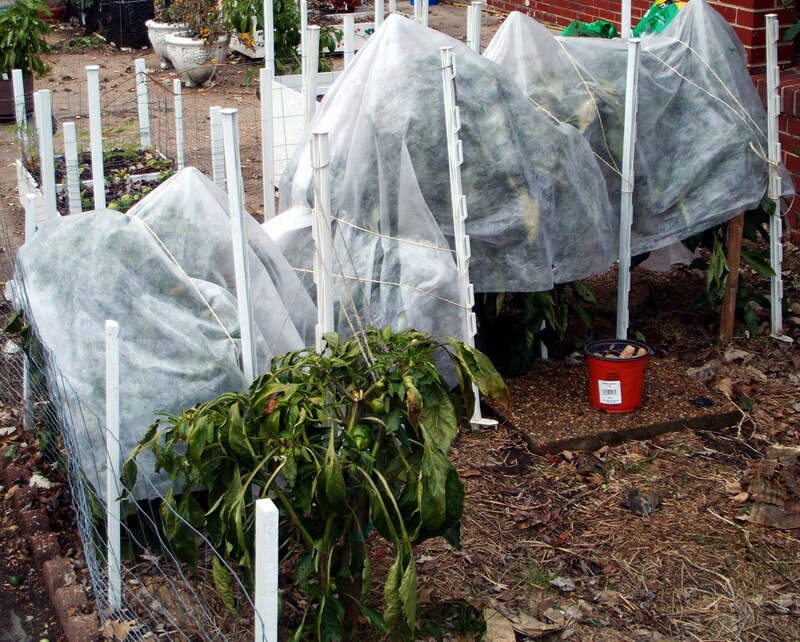 With a double coverage, it can be possible to grow half-hardy to hardy vegetable all winter. The greenhouse is about 3’x 4’ and cost me less than 30$ (2010) in material. My goal during the last 5 years was always to have fresh veggies for Thanksgiving. Often we ended the season around mid-November. This year, we harvested veggies on Thanksgiving day. Garden on, Nicolas. I'm really impressed by the PVC frames you've made. I've been thinking of making several, and your photos will help me shape up my “design.” Thank you. This is the first year I tried extending the garden produce. We have turnips, carrots and spinach growing under row covers. Have you tried over wintering turnips? I think you're on to something there, McArtor. Last week I pulled up some much-overgrown turnips, but not because the heavy frosts had killed them. They were growing nicely in fact. With row covers, I suspect you could keep turnips growing for most of the winter, perhaps all. I hope you or Nicolas tries it. If you do, please post future blogs or comments.